Waseda University (早稲田大学 Waseda daigaku), often abbreviated to Sōdai (早大 Sōdai), is one of the top private universities in Japan. 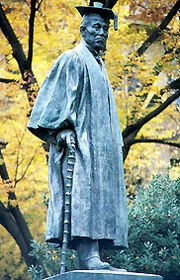 Founded in 1882 as Tokyo Senmon Gakko (College), the institution was renamed "Waseda University" in 1902. It is known for its liberal climate symbolized by its motto Independence of Learning. Six postwar Prime Ministers are Waseda alumni: Tanzan Ishibashi (1956–1957), Noboru Takeshita (1987–1989), Toshiki Kaifu (1989–1991), Keizo Obuchi (1998–2000), Yoshiro Mori (2000–2001), and Yasuo Fukuda (2007–2008). Waseda's literature program is particularly famous, and counts Haruki Murakami and Tawara Machi among its graduates. Its alumni also boasts various corporate leaders such as Masaru Ibuka, co-founder of Sony, Lee Kun-hee, chairman of Samsung, Takeo Fukui, CEO of Honda, Atsutoshi Nishida, CEO of Toshiba, Masuko Osamu, CEO of Mitsubishi Motors, Testuro Toyoda, CEO of Toyota Industries, Kenichi Ohmae, founder and ex-Senior Partner of McKinsey & Co Japan and many others. Currently, seven of the Fortune Global 2007's CEOs are Waseda University graduates. Waseda University is a member of Universitas 21, an international network of 21 leading research-intensive universities. The university was founded by samurai scholar and Meiji-era politician and former prime minister Okuma Shigenobu in 1882, and was designated a full university in 1902. 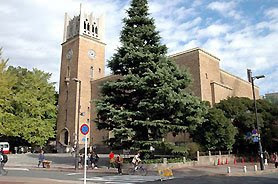 It started as a college with three departments under the old Japanese system of higher education. In 1882, there were department of political science and economics, department of law, and department of physical science. At the same time, along with these departments, English language course was also established, where the students of all the departments could learn English. Three years later, the department of physical science was closed due to few applicants. Department of science and engineering was newly established in 1908. Department of literature was established in 1890. Department of education was established in 1903, and department of commerce in 1904. Waseda University started its life as 'Tokyo Senmon Gakko (College)' on October 21, 1882. Before the name 'Waseda' was selected, it was known variously as 'Waseda Gakko' or 'Totsuka Gakko', after the location of the founder's villa in Waseda Village and the school's location in Totsuka Village respectively. Around 1892, people started to call it 'Waseda Gakko'. It was renamed 'Waseda University' on September 2, 1902, upon acquiring University status.